The Digital Fragmenta Historicorum Graecorum (DFHG) is the digital edition of the five volumes of the Fragmenta Historicorum Graecorum (FHG) produced by Monica Berti at the Alexander von Humboldt Chair of Digital Humanities at the University of Leipzig. The FHG consists of a survey of excerpts from many different sources pertaining to 636 ancient Greek fragmentary historians. Excluding the first volume, authors are chronologically distributed and cover a period of time from the 6th century BC through the 7th century CE. Fragments are numbered sequentially and arranged by works and book numbers, when these pieces of information are available in the source texts preserving the fragments. Almost every Greek fragment is translated or summarized into Latin. The Müller-Jacoby Table of Concordance allows to search correspondences among authors published in the FHG, the FGrHist, and the BNJ. The digital editions of FHG vol. 1 (7.4 MB), FHG vol. 2 (6.4 MB), FHG vol. 3 (7.8 MB), FHG vol. 4 (7.4 MB), FHG vol. 5-1 (2.9 MB) and vol. 5-2 (3.9 MB) are available online. They collect fragments of authors from the 6th century BC through the 2nd century CE, including Apollodorus of Athens (with fragments of the Bibliotheca), historians of Sicily (Antiochus of Syracuse, Philistus of Syracuse, Timaeus of Tauromenius), the Atthidographers (Clidemus, Phanodemus, Androtio, Demo, Philochorus and Ister), Aristotle and his disciples, historians from the time of Alexander the Great until 306 CE, fragments from the beginning of the reign of Constantine (306 CE) through the reign of the emperor Phocas (602-610 CE), and Greek and Syriac historical fragments preserved in Armenian texts. The text of the Marmor Parium (with Latin translation, chronological table, and commentary) and the Greek text of the Marmor Rosettanum (with a French literal translation as well as a critical, historical, and archaeological commentary) are online in a seperate appendix at the end of vol. 1. The five volumes of the FHG are freely available online through Google Books and Internet Archive. 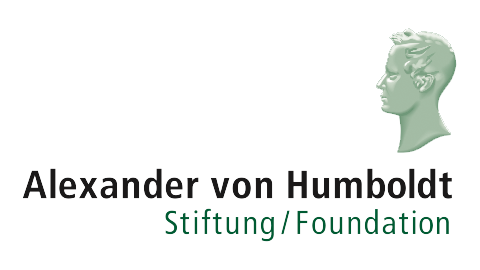 The complete text of the FHG has been OCRed and converted to a machine-readable format as part of the Open Greek and Latin Project (OGL) of the Alexander von Humboldt Chair of Digital Humanities at the University of Leipzig. The DFHG is a model for producing digital editions of fragmentary texts. A full description of characteristics and goals of the project will be available as part of a new book entitled Digital Editions of Historical Fragmentary Texts by Monica Berti. A review of the DFHG Project has been recently published by Richard Fernando Buxton on the Society for Classical Studies blog. 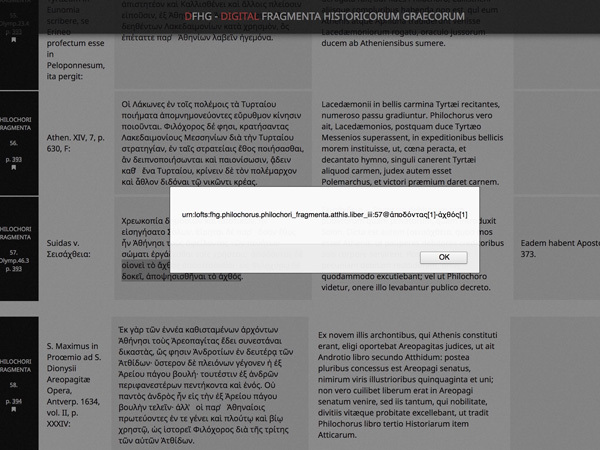 For information about digital data of ancient Greek fragmentary authors available online, see the DFHG Fragmentary Texts. The Fragmenta Historicorum Graecorum (FHG) is the first big collection of ancient Greek historical fragments ever realized. The five volumes have been edited by Karl Müller with the help of Theodor Müller and Victor Langlois. The work has been printed in Paris between 1841 and 1873 by the publisher Ambroise Firmin-Didot. The DFHG is not a new edition of ancient Greek fragmentary historians, but a digital experiment to provide textual, philological, and historiographical solutions for representing fragmentary authors and works in a digital environment. The FHG corpus is open and big enough to allow this kind of computational experimentation. The DFHG is an ongoing project that has been developing many tools and services that can be applied to other collections of fragmentary authors in order to visualize and explore their data, and connect it with external resources for further developments. For an overview of the DFHG project, see below Tools. The digital edition of the FHG has been produced starting from the OCR output of the print edition generated by the Open Greek and Latin Project (OGL) at the University of Leipzig. Combining philological work and scripts, an SQL database has been created for delivering web services and tools. The raw data files are inserted into the SQL DB enriched with information useful to perform searches and citation extraction. Web pages are created using Ajax to retrieve data from the DB in order to increase the usability of the huge amount of the FHG contents. 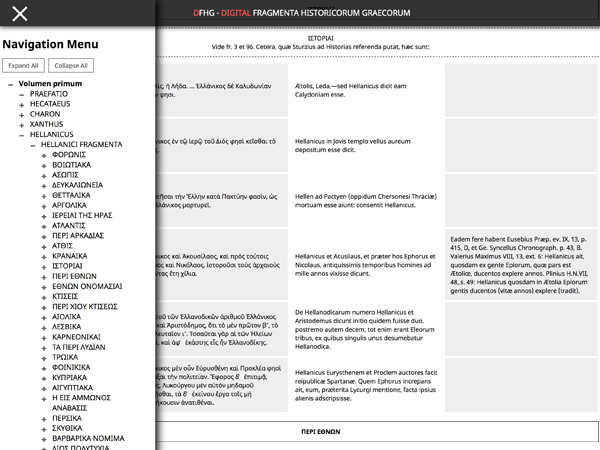 The DFHG offers an easier and deeper access to the Fragmenta Historicorum Graecorum (FHG) thanks to a rich set of capabilities and tools that take advantage of web technologies and database functionalities. The DFHG appears as an Ajax web page automatically generated by a PHP script querying an SQL database of FHG contents. The DFHG is accessible by browsing the whole collection or selecting single volumes. addenda et corrigenda (FHG 1-5). Further notes and additions to the FHG were published by Reinhold Dorschel in 1873. The grey sidebar of the main page shows the original arrangement of pages in the FHG with links to the print edition available through Google Books. The DFHG Digger filters the FHG according to authors, works, work sections and book numbers. By typing and selecting through a live search, users can display the desired part of the collection. It is possible to combine filters using logical AND/OR expressions to get a more precise selection. by searching words directly in the search tool. The search is performed on fragments, translations, commentaries and source texts. Results show the number of occurrences in each DFHG author and are organized by authors and works. Searched words are highlighted in the resulted texts of the DFHG. When available, results display also Morpheus' inflected forms and lemmata, Suda's entries, and entries from the Liddell-Scott Lexicon in the CITE Architecture. the Liddell-Scott Lexicon (LSJ) in the CITE Architecture. Morpheus and LSJ entries still require a work of disambiguation and correction. The connection with Morpheus and LSJ aims not only at getting inflected forms and lemmata of words of the DFHG corpus, but also at contributing to Morpheus and to LSJ by checking and correcting errors. The Index Nominum et Rerum and the Index Marmoris Rosettani of FHG 1 have been created starting from the OCR output of their print version. The selection and the arrangement of the entries depend on the editorial decisions of Karl Müller. Each DFHG slide in/out navigation menu element has a unique identifier expressed as a URN. The syntax of each URN represents the editorial work of Karl Müller, who has arranged the fragments in a sequence and has attributed them to fragmentary authors, works, work sections and book numbers. urn:lofts:fhg.1.hecataeus.hecataei_fragmenta.genealogiae.liber_secundus:350 identifies fragment 350 of the 2nd book of Hecataeus' Γενεαλογίαι in FHG 1. A URN identifies itself as a urn in the LOFTS domain. The acronym lofts stands for the Leipzig Open Fragmentary Texts Series and identifies the domain of textual fragments (i.e., texts preserved as quotations and text reuses in later sources). Work titles in the URN are expressed in the Latin translation provided by Müller in the print edition of the FHG. As URNs, these identifiers are not web-resolvable on their own. By combining them with a URL prefix (http://www.dfhg-project.org/DFHG/#), we have resolvable and stable identifiers. The DFHG project provides also CITE URNs according to the CITE Architecture. CITE URNs are accessible through the DFHG API, the DFHG Fragmentary Authors Catalog, and the Müller-Jacoby Table of Concordance. Using URN identifiers, it is possible to export citations of DFHG fragments and source texts down to the word level. By selecting a portion of text holding down the ALT-key, users get a pop-up window with the URN that identifies the selected chunk of text. urn:lofts:fhg.1.ephorus.ephori_fragmenta.historiae.liber_tertius:37@περιθοῖδαι-ἰξίονος identifies the sentence Περιθοῖδαι, δῆμος τῆς Οἰνηίδος φυλῆς, ἀπὸ Πειρίθου τοῦ Ἰξίονος in Ephorus' fragment 37. Books and chapters are expressed in the Latin form provided by Müller in the print edition of the FHG. The DFHG URN Retriever is a tool for retrieving and citing passages and words in the fragments of the Fragmenta Historicorum Graecorum by typing the corresponding URN. An API can be queried with DFHG author names and fragment numbers. The result is a JSON output containing every piece of information about the requested fragment. XML format files. EpiDoc XML files and well formed XML files of the DFHG are also available through GitHub. 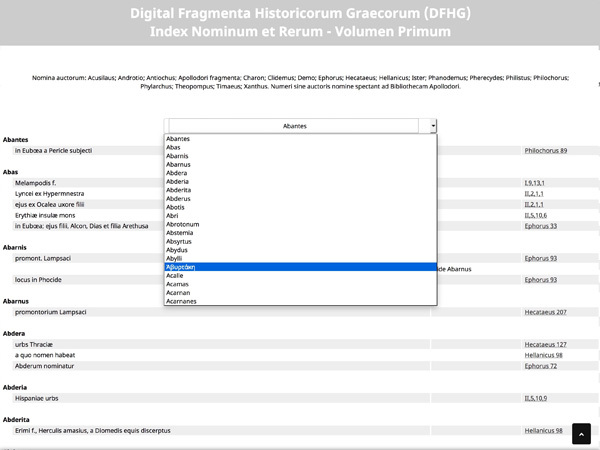 The DFHG Fragmentary Authors Catalog searches and visualizes the 636 Greek fragmentary historians collected in the Fragmenta Historicorum Graecorum (FHG) by Karl Müller. This tool enables users to search the catalog by Authors (e.g., Hippys Rheginus) and Volumes (e.g., FHG 2). The tool includes also a DFHG Fragmentary Authors Map and a DFHG Fragmentary Authors Chart. 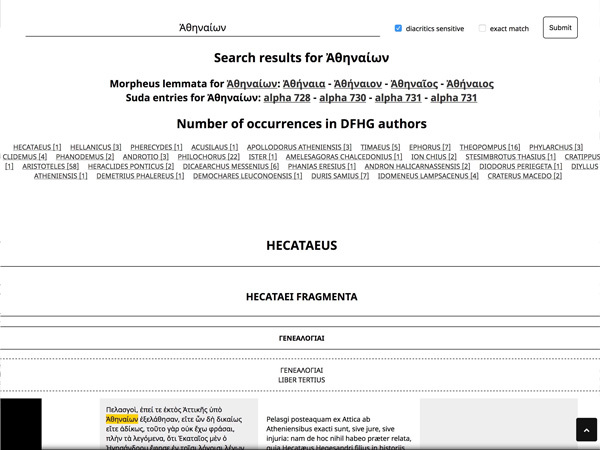 The DFHG Witnesses Catalog searches and visualizes authors and works that preserve text reuses of the 636 Greek fragmentary historians collected in the Fragmenta Historicorum Graecorum (FHG) by Karl Müller. The tool offers also a Witnesses Map, a Witnesses (Authors) Chart, a Witnesses (Works) Chart and a Witnesses Timeline. The Catalog includes also experimental text reuse detection. The Müller-Jacoby Table of Concordance is a tool developed by the DFHG Project for finding correspondences among Greek fragmentary historians published by Karl Müller in the Fragmenta Historicorum Graecorum (FHG) and by Felix Jacoby and other scholars in the Fragmente der griechischen Historiker (FGrHist), including the continuatio and the Brill's New Jacoby (BNJ). The Concordance includes also alphabetical lists of authors published in the FHG, the FGrHist, and the BNJ. The DFHG is based on the digitization of the five volumes of the FHG. Even if nowadays we are able to get good results when OCRing 19th century editions of ancient Greek and Latin sources, it is still possible to find errors in OCRed texts. The DFHG offers the possibility to edit and correct these errors. When searching the FHG with the search tool, an edit button appears on the right side of each row displaying the results. This button allows users to get a new window for suggesting corrections in the text of source texts, fragments, Latin translations and commentaries. The correction will be validated or rejected by the project team through an administration page. The DFHG project offers text reuse detection functionalities that are reachable through the DFHG Wintesses Catalog. The DFHG Witnesses Catalog - Text Reuse Detection tool allows users to automatically detect text reuses in source texts by inserting an XML file URL or selecting one of the PerseusDL or OGL editions. The DFHG "text reuse detection" is based on the Smith–Waterman algorithm that performs local sequence alignment to detect similarities between strings. Smith-Waterman has been used for sequencing DNA, and for detecting plagiarism and collusion by comparing sequences of text. Expand and collapse authors and works in the DFHG slide in/out navigation menu to navigate the FHG down to the fragment level. Following the link to each navigation menu element, it is possible to jump to the relevant section of the FHG in the DFHG main page (37 MB) without reloading it. DFHG contents (introductions, fragments, translations, commentaries and source texts) are searchable both by holding down the SHIFT-key when higlighting words with the mouse in the DFHG main page and by searching words directly in the search tool. Using URN identifiers, it is possible to export citations of DFHG fragments and source texts down to the word level. By selecting a portion of text holding down the ALT-key in the DFHG main page, users get a pop-up window with the URN that identifies the selected chunk of text. The DFHG includes also the indices that are sometimes published at the end of FHG volumes. It is possible to find index entries in two ways: 1) by clicking the bookmark icon under each fragment number and page for the entries of that specific fragment that are included in the index; 2) by searching entries directly in the indices.